On Any Given Sunday Afternoon | Lancaster County Timber Frames, Inc.
Knowing my economic limitations when I was a good bit younger I pretty much had honed my ability to defer gratification to the point where even the thought of owning a dependable vehicle didn’t cross my mind. I was 24 years old, teaching during the day and pursuing my master’s degree on evenings and weekends. My vehicle, of monetary necessity, was a high mileage VW Bug. I had owned a long succession of well-used Beatles. I had a set of metric tools, a bin full of spare parts and a wonderful book entitled How to Keep Your Volkswagen Alive: A Manual of Step by Step Procedures for the Compleat [sic] Idiot. It was published in 1969 and was probably the forerunner of the ‘Dummies” series which continue to this day. I had promised myself that I would postpone buying anything new and exciting until I had completed my Master’s. But, it was May and I had completed all my course work for the degree and only needed to write my thesis so I thought I’d just stop at a motorcycle shop to “look around”. Bad move. I had read a number of articles and tests on the bike in which I was interested. That bike, a Suzuki T500 Titan, had been on the market about two years. Its engine was a 500cc, twin cylinder, two stroke. Up until then it was pretty much believed impossible that a two stroke twin that large could dissipate heat efficiently enough to avoid piston seizure. But after two years and a number of road and track tests, it was universally acknowledged that Suzuki had succeeded. In fact, even today, almost 50 years after it was first introduced, that engine is acknowledged by those in the sport to have been one of the most bullet proof engines ever developed. That the bike listed for $895 while a Harley Sportster had a $2450 price tag was cause for my resolve to weaken. For less than $1,000 I could have this beautiful bike, two helmets and a pair of gloves. I asked the dealer to let me kick start the bike (there were no electric starters back then) and take it for a short spin so he rolled it outside and let me have a go with it. The engine had the typical two stroke whine, not too loud even at speed. But under hard throttle the engine broadcast a sound that only can be described as that of a swift angry beast sucking in great volumes of air. It wailed!!! I made my neck hair stand on end. God, I loved that sound. Still do. Two days later after securing a loan the bike was mine. I was in heaven. I wouldn’t ride in the snow but other than that I road it in the rain, cold and wind. It took it on trips to New England and to the deep South. I washed and waxed that bike so often over the six years I owned it that, in places the paint wore so thin it became transparent. For reasons I can’t remember I sold the bike to my brother, who also rode for six years before selling it. At one time or another in the ensuing decades I have owned three Yamahas and three Harleys. None of them connected with me the way that Titan had. Every once in a while over the years I’d check the ads in cycle magazines and then later ebay to see if I could locate a duplicate of the Titan. Dogged persistence finally paid dividends seven years ago. An east coast restorer of some renowned had listed the same bike, same color fully rebuilt and at a price I couldn’t resist. I acted so swiftly that I neglected to even discuss it with my wife – another big mistake. In good weather I ride it at least every Sunday afternoon. The trips are of moderate length, maybe an hour or two. 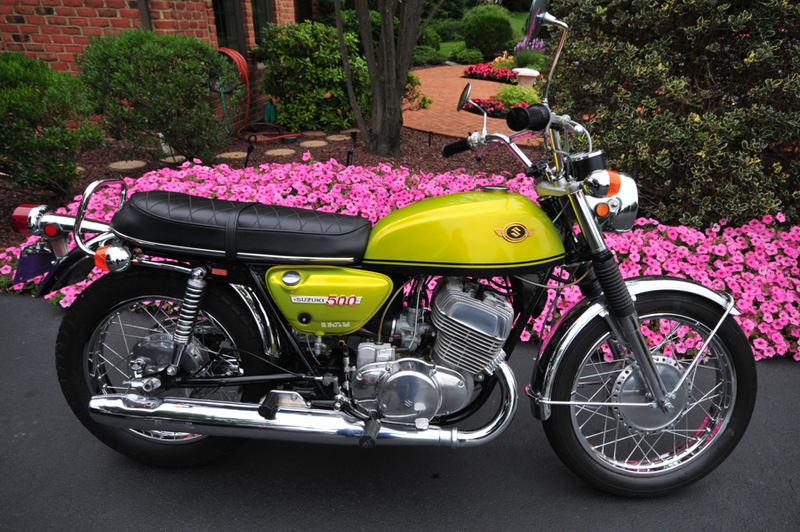 In some Twilight Zone sort of way, this 1969 Suzuki has become my time machine – when I’m on it the air tastes better, my senses tingle, I am young again and I may live forever. On some evenings I’ll sit in the garage, cup or glass in hand and simply look at the bike. To me, it is rolling sculpture and it’s sound is music.